So, this weekend at Wizard World Philadelphia, Dynamite announced an upcoming comic book series based on Blackbeard. (You can read about it here, here, here or here, as well as probably a few other places.) 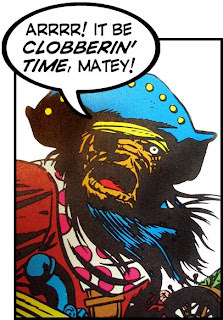 Using Blackbeard as a comic book character is, of course, nothing new. It took me all of ten seconds to confirm comic book stories about him going back to at least 1955. Blackbeard, of course, is extremely attractive as a character. He specifically engineered a larger-than-life persona and his short life as a pirate (a scant 18 months!) is literally the stuff of legends. Not to mention that he's a figure floating in the public domain, so doing a story about him works not unlike a franchise of a well-known character (like, say, Batman or the Hulk) but without all the legal hoops and licensing to sort through. Here's what I find curious, though: The series was first announced last September and this weekend we started hearing the first real details of the series, but it still won't land in comic book shops until 2009. Now, I understand that a publisher wants to create some buzz around a project before it's actually released. But the danger in creating too much buzz too early is that your audience will get tired of buzz with zero chance of being able to actualize it. If the book isn't due out until 2009, that means it won't even be seen in Previews until October at the very earliest. Which is still, obviously, several months off. The other factor is that there is zero art for this project so far. I wouldn't expect finished production-ready pages at this point, but we don't even have character sketches. Which is hardly surprising since an artist has yet to even be announced. All the "promo" artwork that's been used thus far have been historical pieces. Regardless of how good the writers are, a bad artist can really wreck a comic book story. I can understand that Nick Barucci is excited about the project. I would be, too. But I think that, from a marketing perspective, he's jumping the gun a bit. I don't think he's in a position where he's actually going to generate TOO much hype around this project too soon, but it seems to me like he's putting too much effort into said hype too early to be useful. Most people who might consider picking a book like this up will likely forget about it until later this year or early next when it's available to pre-order. I'm actually quite interested in seeing this, and I can guarantee you I'll have totally forgotten about it by the end of the month. With all that said, I'll give Barucci a lot of credit. He's managed to keep his business going strong for over a decade despite what I would've considered an all-too-limiting and unsustainable business model. So, I'll be trying to keep an eye on this Blackbeard project in part because I want to see what they do with it, but also to see how well the marketing behind it works.